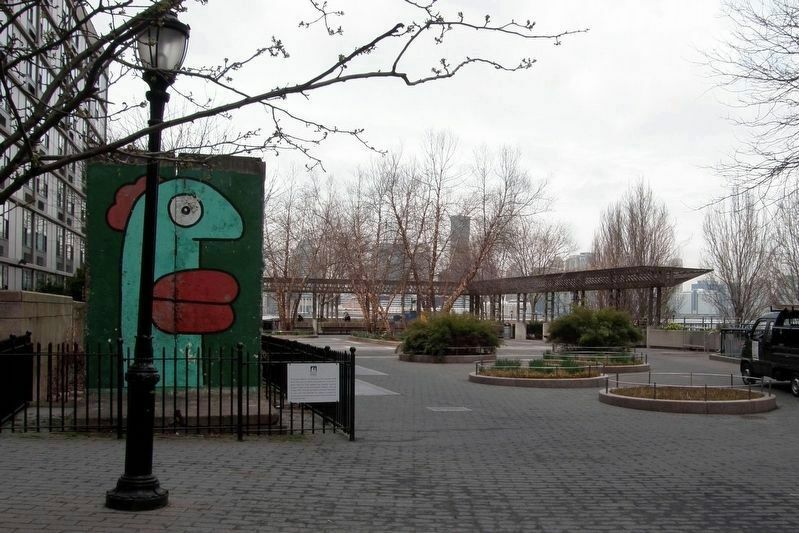 In November 2004, the 15th Anniversary of the dismantling of the Berlin Wall, the city of Berlin donated this piece of the Wall to Battery Park City. 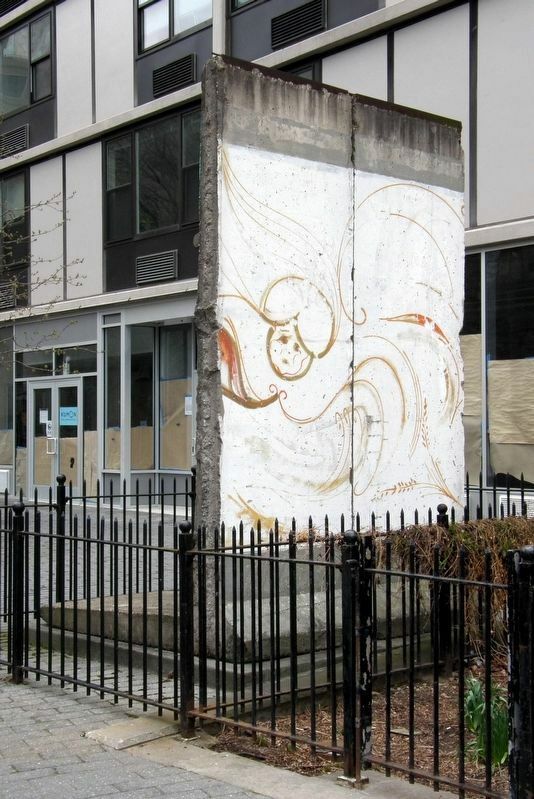 These segments were originally located in downtown Berlin in the area between Potsdamer Plaza and Leipziger Platz. 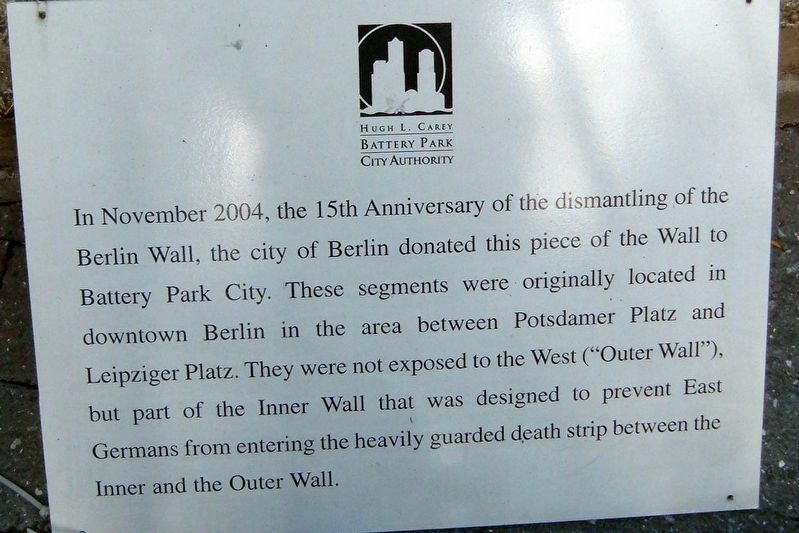 They were not exposed to the West (“Outer Wall”), but part of the Inner Wall that was designed to prevent East Germans from entering the heavily guarded death strip between the Inner and Outer Wall. Erected 2004 by Hugh L. Carey Battery Park City Authority. Marker series. 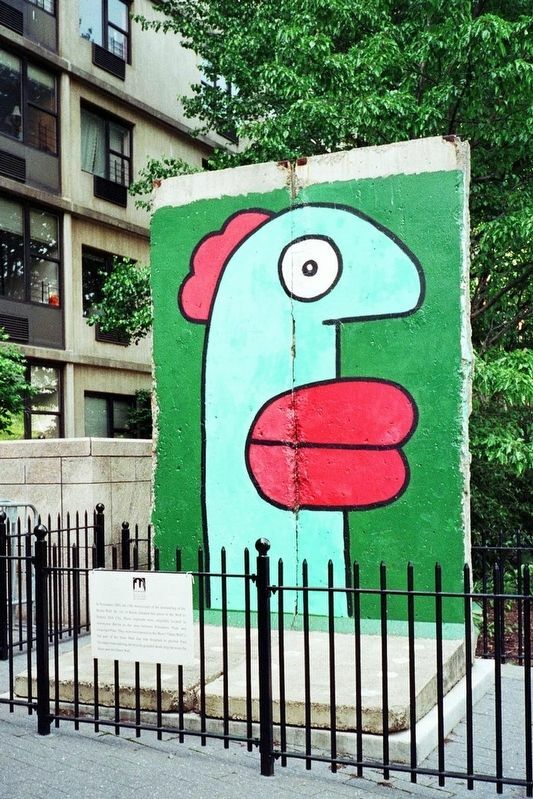 This marker is included in the Berlin Wall marker series. Location. 40° 42.703′ N, 74° 1.003′ W. Marker is in New York, New York, in New York County. Marker can be reached from Liberty Street near Battery Park City Esplanade. Touch for map. The marker is in Kowsky Plaza near St. Joseph Chapel. Marker is at or near this postal address: 393 South End Avenue, New York NY 10280, United States of America. Touch for directions. (approx. 0.2 miles away); The West Street Building (approx. 0.2 miles away); Grosse Kugelkaryatide (Great Spherical Caryatid), 1971 (approx. 0.2 miles away); World Trade Center (was approx. 0.2 miles away but has been reported permanently removed. ); The Anne Frank Tree (approx. ¼ mile away); James Joyce Pub Award (approx. ¼ mile away); DC 37 September 11, 2001 Memorial (approx. 0.3 miles away). Touch for a list and map of all markers in New York. The other side of the wall segment. More. Search the internet for Berlin Wall segment. Credits. This page was last revised on April 14, 2019. This page originally submitted on January 19, 2019, by Larry Gertner of New York, New York. This page has been viewed 42 times since then. Last updated on April 12, 2019, by Larry Gertner of New York, New York. Photos: 1, 2. submitted on January 19, 2019, by Larry Gertner of New York, New York. 3, 4. submitted on April 12, 2019, by Larry Gertner of New York, New York. • Andrew Ruppenstein was the editor who published this page.